This mask forming, nutrient rich topical gel helps renew skin texture rendering it softer, smoother, and firmer. With regular use, fine lines around the eyes and mouth gradually decrease, while devitalized skin regains a luminous radiance. OXYGEN GEL also helps minimize uneven skin pigmentation marks and retards the aging process. OXYGEN GEL is available in 2 oz. plastic cosmetic container jars. Evening: Cleanse face well, Lightly glide your fingers over the gel and apply a small amount over face and neck, concentrating under the eye area. Your skin firms as the gel dries. Oxygen Gel's nutrients feed the skin all night, while restoring ideal moisture balance. Morning: Wash off Gel. Your face will feel clean and fresh. Than re-apply a light film. Skin firms as the Gel dries. Nutrients feed and protect the skin all day. Also use on any non-facial areas requiring revitalization. Quick Mask: Apply a light film at any hour of day or night and leave on for one hour. Was off Face will feel revitalized and nourished. Moisturizer and makeup tips: If more moisturizing is desired, either mix gel with your favorite moisturizer when applying, or apply gel first, and then the moisturizer. You may also apply makeup or sunscreen over Gel. For Persistent conditions: You may add 1 or 2 drops of original Cellfood concentrate to the Oxygen Gel for special skin problems. 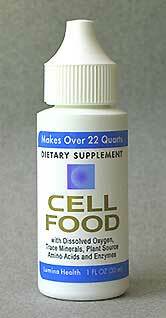 Don't add the Cellfood to the jar of Oxygen Gel, rather, mix a drop in the palm of hand or cap. Gel will become more liquefied, and will penetrate our skin's cellular tissue and enhanced oxygenating power. Note: A generous layer of Oxygen Gel is desirable for healing skin problems, and may result in some miner flaking as the mask dries. For cosmetic use, using a thinner layer will prevent this.